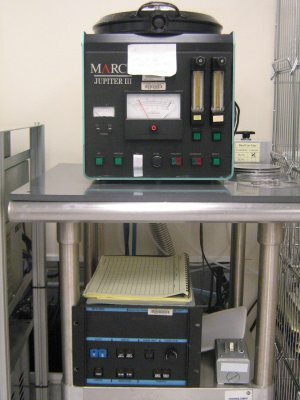 The March Jupiter III is a parallel plate reactive ion etcher, which offers fast, uniform, and selective etching. The Jupiter III is typically used for wafer descumming and ashing. The maximum sample size is 6 inches. The system is equipped with a maximum 300W RF power supply. The available process gases are oxygen, argon, and forming gas which are adjustable using a rotameter.